The ideal midrange disintegrator for industrial and government applications. 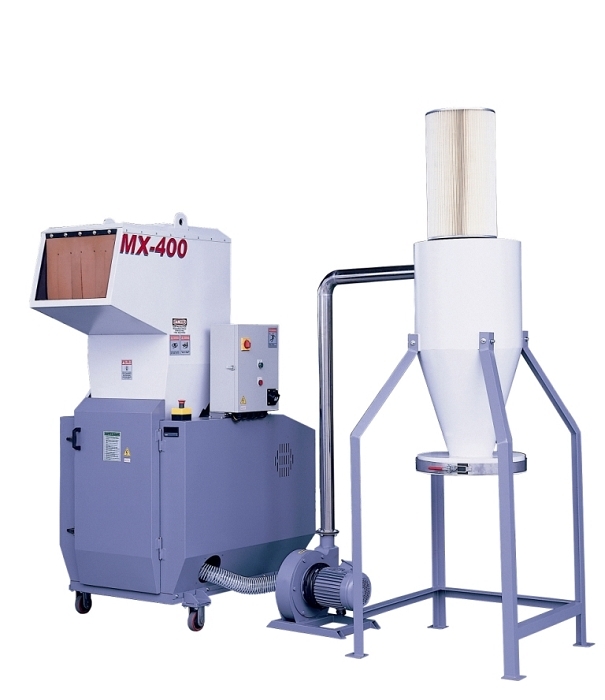 The MX-400 Multi-Media Disintegrator is manufactured using advanced integrated sound suppressing panels and a double walled sound insulated hopper. This advanced design eliminates the need for bulky, expensive sound enclosures, reducing system cost and cutting maintenance time in half. Has been evaluated by NSA and meets NSA/CSS Specification 02-02, High Security Disintegrators and NSA/CSS 04-02, Optical Media Destruction Devices for classified shredding using a 3 mm screen. The unique 8 Blade Cutting System easily handles Paper, CD's, Key Tape, ID Cards, Video Tapes, Floppy Discs, Microfiche, Hard Drives and shreds up to 1200 lbs per hour! Features an Extra Large 16 x 19 Feed Opening, user friendly control panel, multiple safety interlock switches and large castors for mobility. The standard configuration includes the 3 hp Single Bag Waste Collection System. Optional conveyor belt, upgraded double bag system and larger blower make this system easy to customize to fit any application. Screen sizes are available from 2mm to 12 mm.